RONALD REAGAN. 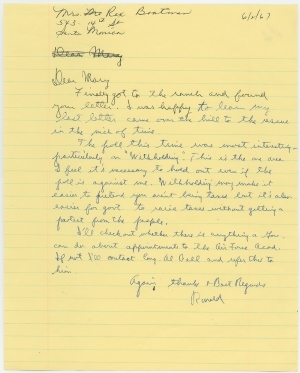 Autograph Letter Signed as governor of California, to Mary Boatman, June 2, 1967. 1 p. 8 x 10 in. Address penned by secretary, and then letter penned by Reagan. Finally got to the ranch and found your letter. I was happy to learn my last letter came over the hill to the rescue in the nick of time. The poll this time was most interesting, particularly on “Withholding.” This is the one area I feel it’s necessary to hold out even if the poll is against me. Withholding may make it easier to pretend you aren’t being taxed but it’s also easier for govt. to raise taxes without getting a protest from the people. I’ll check out whether there is anything a Gov. can do about appointments to the Air Force Acad. If not I’ll contact Cong. Al Bell and refer this to him. In May 1967, Field Research conducted a poll of 1,027 Californians regarding whether they would prefer a “pay-as-you-go” plan for the state income tax. Under the proposed system, each taxpayer would have a portion of the state tax withheld each month from his or her wages, the way federal income tax is. The results indicated that 47 percent favored the plan, 44 percent opposed the plan, 5 percent gave a qualified opinion, and 4 percent had no opinion. While 53 percent of California Democrats favored the proposal, only 37 percent of Republicans did. Although Assembly Speaker Jesse Unruh and State Senate Leader Hugh Burns favored the plan, as did former Governor Pat Brown, Governor Ronald Reagan expressed his opinion that he was “unalterably opposed” to a payroll withholding plan and would only sign such legislation “if there was a gun at my head.” According to pollster Mervin D. Field, “Reagan has taken the position that a withholding plan makes tax payments much too palatable. He feels the taxpayer will be more cognizant of the taxes he is paying if once a year he has to write a check in payment for his state income taxes.” Reagan reflects that position in this letter to Boatman. By late June 1967, Reagan’s overall approval rating in California increased several percentage points over early May. In late June, 74 percent of the state’s citizens thought he was doing a good or fair job, up from 66 percent six weeks earlier. Among the reasons cited, 6 percent favored his opposition to the withholding tax. “Taxes should hurt,” Reagan famously said in opposing the plan. In December 1971, Governor Reagan signed a bill to withhold state income taxes from worker’s paychecks, ending California’s status as the only state among the 38 that had income taxes that had no withholding. Each member of Congress is allowed to nominate candidates for the United States Air Force Academy in Colorado, and the Boatmans were likely looking for a nomination for one of their twin sons John and James Boatman, who had just turned 18. John went on to serve in the U.S. Air Force. Ronald Reagan (1911-2004) was governor of California from 1967 to 1975. He won election over two-term incumbent Pat Brown. Late in 1966, he sold 236 acres of his Yearling Row ranch to Twentieth Century-Fox Studios to help pay debts from his campaign, but he continued keep horses at and makes short visits to the ranch. As governor, he opposed the idea of the welfare state and favored less government regulation of the economy. Despite an unsuccessful attempt to recall him in 1968, Reagan was reelected in 1970 for a second term. He did not seek reelection in 1974, but went on in 1976 to seek the Presidency. He narrowly lost the Republican nomination to incumbent Gerald Ford, but went on to win in 1980 to become the 40th President of the United States (1981-1989). Mary M. French Boatman (1913-1983) was born in Cleveland, Ohio and married Rex Albert Boatman (1913-2003) in 1935. They had three children, including John Frederick Boatman (1939-2016). Alphonzo Bell Jr. (1914-2004) was born the son of millionaire philanthropist Alphonzo Bell in Los Angeles County, California. The younger Bell graduated from Occidental College in 1938. After service in the United States Army Air Corps from 1942-1945, he was a rancher, real estate investor, and businessman. He served as chairman of the Republican National Committee from 1956 to 1959. He represented California in the United States House of Representatives from 1961 to 1977. Single vertical fold and a few stray ink stains, otherwise very clean. Previous dealer’s markings on verso. From the Estate of Malcolm S. Forbes.